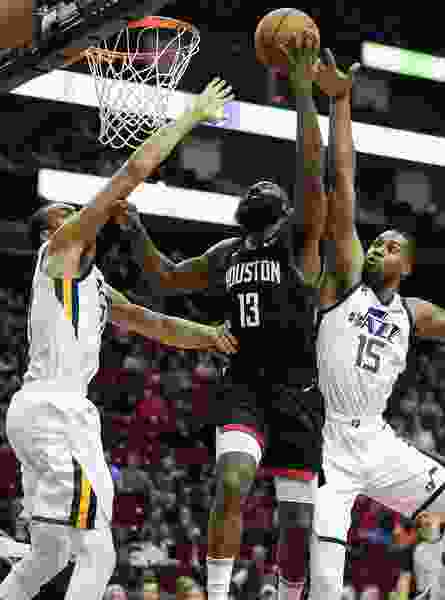 Houston • Wednesday’s win against the Rockets was a big step for the Jazz after consecutive home losses to the Warriors and Grizzlies. Up next comes another big step, against the Anthony Davis-led New Orleans Pelicans, who are looking increasingly like they’re the real deal. And then another, versus the improving Mavericks, who seemingly have been re-energized by rookie Luka Doncic and bolstered by the addition of DeAndre Jordan. And still another, against the decidedly fractured but undeniably talented Timberwolves. Given all those potential big steps the Jazz are taking, when, then, might the team ascertain exactly where those steps are taking them? At what point are coaches and players able to stop saying “It’s too early to tell” and become capable of divining how any game, or any stretch of them, becomes indicative of a bigger, grander picture? Utah’s Quin Snyder was not that dismissive, but nevertheless is inclined to a view that any singular result — victory or defeat — is fraught with the potential to be blown out of proportion. So then, for now at least, each game remains an end unto itself, and is a means to a bigger end only insofar as the team determines that every passing contest is generating cumulative progress and improvement. The whole one-game-at-a-time mantra is cliché, but players still say it by rote and maintain there is merit to it, especially as the team is finding its footing. There is, after all, much work yet to be done, as both Joe Ingles and Jae Crowder said Wednesday. Donovan Mitchell, who snapped out of a three-game funk with a scintillating 38-point, seven-assist effort against the Rockets, can certainly appreciate the value of keeping proper perspective. While praising his teammates for telling him to “stay aggressive and stay with it,” he pointed out that his performance in Houston would not actually alter that. That, Snyder said, is exactly the right approach. All of which is fine and great. But center Rudy Gobert, for one, at least seemed willing to acknowledge that while continued progress is indeed the goal, it doesn’t come in a vacuum — that these athletes are not their “NBA 2K” avatars, where improvement is a sterile achievement accomplished by moving a sliding scale a few notches to the side. Asked about the importance of this four-game trip, Gobert initially responded with the default “We wanna take it one game at a time,” before acknowledging that yes, the two-game losing streak was frustrating, and yes, it was absolutely wonderful to kick it to the curb. Snyder, meanwhile, when asked if facing three 2018 playoffs qualifiers in a stretch of four games was a good or bad thing for his team this early in the schedule, pointed out that while the competition on this trip is indeed challenging, so too were the preceding games, for that matter.